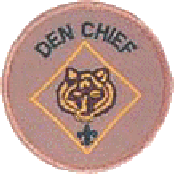 The Den Chief works with the Cub Scouts, Webelos Scouts and Den Leaders in the Cub Scout Pack. By accepting the position of Den Chief, you agree to provide service and leadership to your troop. The responsibility should be fun and rewarding.